Named after the English-born Australian explorer Augustus Charles Gregory (1819-1905), the tree is found in the Kimberley region of north-western Australia, and is easily distinguishable from its African cousins by its bulbous bottle-like trunk. As with the African Baobab, the Bottle tree is thought to have arrived from Madagascar by sea. A seed pod is believed to have floated east some 8,200km (5,000 miles) across the Indian Ocean and landed somewhere near Derby, close to where we find Australia’s most famous Boab specimen, the Prison Tree. Sacred to the Aboriginal people and called variously Larrkarti, Junguri, Wajaar and Jumulu, the tree was a source of food, water, shade, refuge and held spiritual significance. The Boab nuts are carved and painted with traditional Aboriginal art. 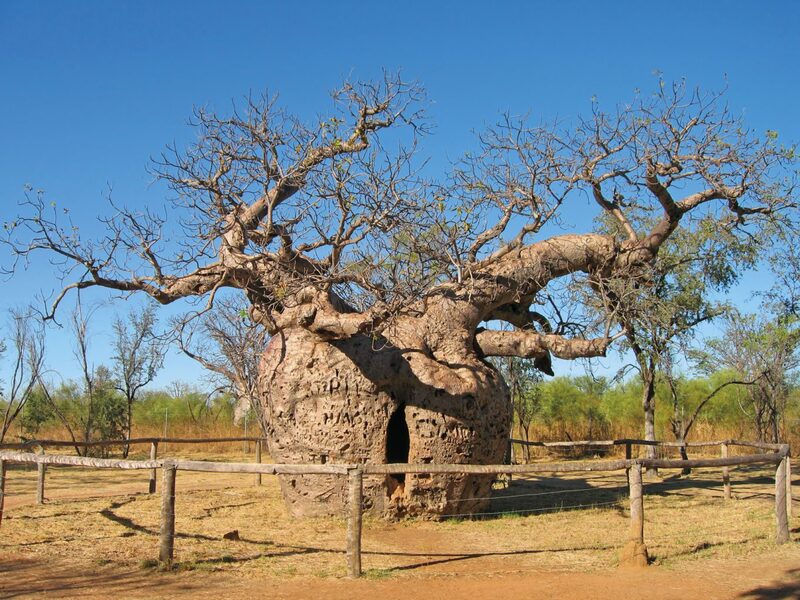 Recent studies suggest that the Boab’s spread across the Kimberley was due to the movement of Aboriginal people, who travelled carrying its fruits as a portable food source, dispersing seeds wherever they went. According to folklore the Prison Tree came by its name in the 1890s when a group of Aboriginal prisoners, arrested for stealing cattle, where chained beneath its shade for a night whilst en-route to the court house at Derby. The hollow tree held the bones and spirits of their ancestors. Measuring 14m (45.9ft) around its squat, swollen bole, the Prison Tree – thought to be up to 1,500 years old – is carved with graffiti, some of it spanning a century or more, a practice the authorities have sought to deter with the erection of a rough wooden fence.